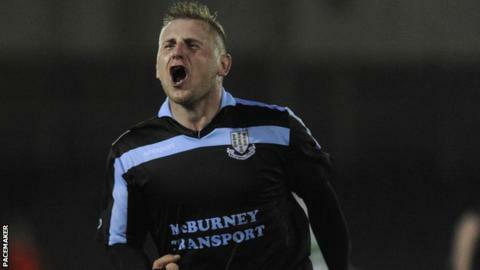 A David Cushley hat-trick saw 10-man Ballymena United recover from a goal down to beat Donegal Celtic after extra-time in the County Antrim Shield. Donegal Celtic took the lead through Ryan Dunlop on 72 minutes after Mark Surgenor had been shown a red card. Cushley levelled on 88 minutes and added two further goals in extra-time. A Kym Nelson goal and an own goal helped Glentoran edge out Larne 2-1, Bangor trounced Glebe Rangers 6-0 and Newington YC beat Immaculata 2-1. Ballymena midfielder Surgenor received a straight red card for a late tackle on Emmett Templeton and Dunlop put Championship One side DC in the driving seat when he headed home from close range. Cushley smashed a volley into the net through a crowded penalty area to level with two minutes left and then fired in after latching onto a Darren Boyce back-heel early in extra-time. The winger, who extended his contract at the Showgrounds last week, completed his treble from the penalty spot. Another Championship One outfit, Larne, proved formidable first-round opposition for the Glens at the Oval but Nelson struck just before the interval to put the hosts in front. An Eoin Gillan own goal gave Eddie Patterson's side some breathing space, before Ciaran Murray scored a consolation strike from eight yards. Jordan Forsythe was the hat-trick hero for Bangor as they comfortably saw off the challenge of Glebe Rangers to progress to the last eight. Paul McDowell grabbed two goals, with Andy Long blasting in from long distance to get his name on the scoresheet. Newington took the lead with a Conal Burns penalty, but John Boyce equalised for Immaculata, before Joe Finlay secured the winner before the break. Cliftonville had already made the Shield quarter-finals by defeating Ballyclare 5-2 at Dixon Park last week. Crusaders received a bye into the next round after their opponents, Carrick Rangers, withdrew from the competition as they were unable to fulfil the fixture because they do not have floodlight facilities available at present. Holders Linfield begin their defence at home to Dundela on Wednesday night, while Ards take on Ballymoney United.